Let's say a group of friends are sitting down for a meal at a restaurant. To make this simple at first, let's assume that there are only two friends, Joey and Chandler. Now lets consider two ways that Joey and Chandler, (J and C for short) could pay for the meal. The ordinary way (scenario 1) would be for J and C to pay only for what they each ordered. Another way (scenario 2) would be for J and C to each pay a proportionate amount of the total cost of the meal. Let's look at these scenarios mathematically. Using subscripts J and C to indicate which friend is involved with the variable, Let P = the price of food, and let Q = the quantity of food. To simplify, we shall assume that the restaurant only serves one item in discrete units, slices of pizza for $2 each. Now let's look at how the costs will change under the different scenarios. TC = (P*Q1 +P* Q2 +... + P*Qn)/N. MC = d(Pj)/d(Qj) = $2/2 = $1. Thus, with the introduction of Chandler under scenario 2, Joey's marginal cost of a slice of pizza has been cut in half. Now what if another friend, Monica, joined in with scenario 2? Joey's new marginal cost for pizza would be cut to a third: $2/3 = $0.67. If six friends total joined in the meal, Joey's marginal cost would be $0.33. This would be the marginal cost for all other participants as well. With a lower marginal cost, each participant will consume more. But as will be shown, some will benefit more than others from this decrease. We can see from these demand functions that Joey likes pizza more than Chandler. Joey will thus benefit from scenario 2 more than Chandler will. Finding the point where Marginal Benefit = Marginal Cost, by substituting the $1 for MC, and solving, we see that Joey will consume 7 slices of pizza, and Chandler will only consume 3. They both will however, cover the same cost of $10 per person. Through the agreement on proportional payment Joey, in essence, gets Chandler to pay for two of his pizza slices. So under scenario 2, Chandler gets screwed, because he is not a pizza eating machine like Joey is. When the cost of pizza (or any asset) is to be split proportionally among a group, all members of the group will consume more than they would have otherwise. Under a proportional cost sharing agreement, those who consume more than the mean are able to shift their costs onto those who consume less than the mean. Due to the cost sharing agreement, a simple meal among friends becomes like a pizza eating contest, and the more participants there are, the more of a contest it becomes. Imagine, instead of a small group, that 2000 people all decided to eat this same $2 pizza, with the agreement that each person would pay for a proportional amount. 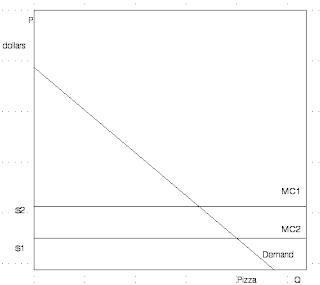 For all participants, the marginal cost of pizza would be $2/2000 = $0.001 per slice, which is practically free. Lets say that the mean quantity of pizza consumed by these 2000 people was 5 slices, thus a total of $10 would be paid by each participant. But what if, out of these 2000 people, one person happened to be the crowned world champion pizza eater, who consumed 30 slices? This person would end up getting a major bargain for pizza (but would probably pay for it later with digestive problems). I have only recently begun thinking about these properties of cost sharing, and will be looking for other real-life instances of this behavior. I hope to soon expand upon these ideas in more depth, in future postings that involve assets other than Pizza. Not only does this stimulate my brain, but my stomach, as well. Cool that you're bringing a real life social scenario to economics.